Software libraries are an amazing way to speed up coding for Android. Leverage the hard work of other developers to make your life easier. 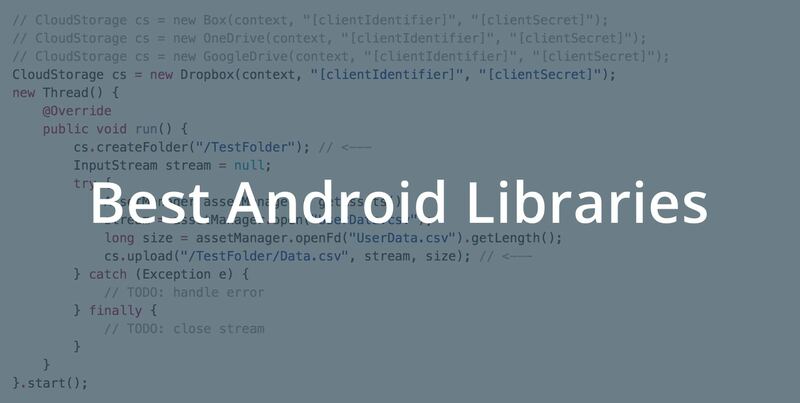 There are tons of amazing Android libraries out there, but how to find the right one? We put together this list to give you a start. Android View Animations: A powerful animation library that makes it really easy to create various effects. RecyclerView Animators: Allows you to use the RecyclerView class with several cool animations. CloudRail: CloudRail helps you to integrate services via API much faster. It bundles multiple services like for example Dropbox, Google Drive and OneDrive into a single, unified API. Moreover it handles API updates for you and keeps the API towards your code consistent. Interfaces are available for Cloud Storage, Social, Payment, Messaging (Chat Bots) and many more. Retrofit: Retrofit by Square is a type safe REST client for Android. It basically turns an http API into a Java interface. MPAndroidChart: A powerful library to generate charts on Android. Offers eight different chart types and a lot of gestures. SQLBrite : Creates a wrapper around SQLiteOpenHelper and ContentResolver to use stream semantics in queries. Sugar ORM: Easy way to work with a SQLite database without the need to write SQL queries. Eclipse Collections: Collections framework for Java to eg put iteration methods on the container types. TimesSquare for Android Simple and standalone widget to pick a date from a calendar view. Material Calendar View Android’s CalendarView ported to Material design. Unified Cloud Storage API: A solution which allows you to integrate Dropbox, Google Drive, OneDrive and many more via a single API. Unified Enterprise Cloud Storage API: Integrate backend cloud storage providers like AWS S3, Microsoft Azure, Google Cloud Storage, Rackspace and more via one API. Android Swipe Layout: Provides swipe functionality for objects. For example swipe to left to delete it. Unified Messaging API: A universal API for Facebook Messenger, Telgram, Line, Viber & more. Made for chat bots. Unified Social API: Integrate functions from Facebook, Twitter, LinkedIn, Instagram, Microsoft and many more into your app. To be continued! We hope that this list and CloudRail helps you to build amazing Android apps.